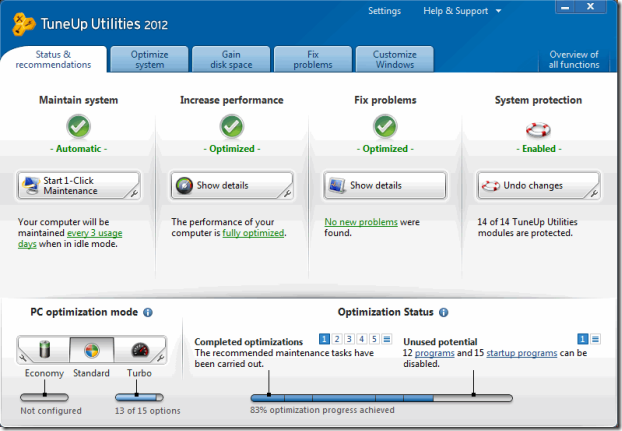 Tune up utilities 2012 is the latest version introduced by tune up utilities. It is the best alternative and the most popular utility as a Windows Optimization tool. The new version has all the features present as they were in Tune up Utilities 2011, and it has brought new improvements and features and fixed bugs in it. Well, Tune up utilities helps you to provide a better maintenance to your Computer. Helps you to defragment Hard drives. Improve System Performance and Battery life. Analyze and troubleshoot your PC. It includes a 1-click maintenance feature. Delete unnecessary data and clean temporary files and gain disk space. So, after reviewing all the features of this resourceful utility, it's time to download it. DOWNLOAD TUNE UP UTILITIES 2012 HEREIf you are new to tune up utilities, and want to review all its features in details and want to learn how to use it, then refer the below link.